This article is about the city in Libya. For other uses, see Sirte (disambiguation). Sirte (/ˈsɜːrt/; Arabic: سرت‎, pronunciation (help·info); from Ancient Greek: Σύρτις), also spelled Sirt, Surt, Sert or Syrte, is a city in Libya. It is located south of the Gulf of Sirte, between Tripoli and Benghazi. It is famously known for its battles, ethnic groups, and loyalism to Muammar Gaddafi. Also due to its development, it was the capital of Libya as Tripoli's successor after the Fall of Tripoli since 1 September 2011 to 20 October 2011. The settlement was established in the early 20th century by the Italians, at the site of a 19th-century fortress built by the Ottomans. It grew into a city after World War II. As the birthplace of Muammar Gaddafi, Sirte was favoured by the Gaddafi government. The city was the final major stronghold of Gaddafi loyalists in the Libyan Civil War and Gaddafi was killed there by rebel forces on 20 October 2011. During the battle, Sirte was left almost completely in ruins, with many buildings totally destroyed or damaged. Six months after the civil war, almost 60,000 inhabitants, more than 70 percent of pre-war population, had returned. Sirte is built near the site of the ancient Phoenician city of Macomedes-Euphranta, which was an important link on the road along the Mediterranean Sea littoral. It is the last confirmed place where the Punic language was spoken, in the 5th century CE. The region had no recognized administrative centre and was infested for centuries by bandits. In Classical times, the coast was "proverbially dangerous to shipping", called "inhospita Syrtis" in Virgil's Aeneid.John Milton's Paradise Lost Book 2 lines 939-940 speaks of "a boggy Syrtis, neither sea/Nor good dry land". In 1842 the Ottomans built a fortress at Marsat al Zaafran ("saffron harbour") which became known as Qasr al Zaafran ("saffron castle"), and later as Qasr Sert. The fortress was built under sultan Abdülmecid I as part of the restoration of Ottoman control over Tripolitania after the fall of the Karamanli dynasty. It was around this fortification, which was taken over and repaired by the Italians in 1912, that the settlement of Sirte grew up. 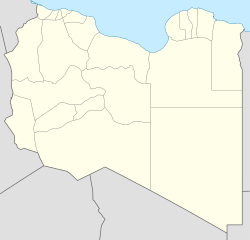 Sirte served as an administrative centre under Italian rule. During the North African Campaign of the Second World War there were no noteworthy events in this location, which was characterised at the time as "a shabby little Arab village of mud huts, clustered on the banks of a foul-smelling stream." The village grew into a prominent town after the Second World War for two reasons – the discovery and exploitation of oil nearby and the birth of Muammar Gaddafi in 1942 in a tent at Qasr Abu Hadi, some 20 kilometres (12 mi) south of Sirte. He was sent to the primary school at Sirte at the age of ten. After seizing power in 1969, Gaddafi transformed Sirte into a showcase of his self-proclaimed revolution, carrying out an extensive programme of public works to expand the former village into a small city. After 1988, most government departments and the Libyan parliament were relocated from Tripoli to Sirte, although Tripoli remained formally the capital of the country.Al-Tahadi University was established in 1991. In 1999, Gaddafi proposed the idea of creating a "United States of Africa" with Sirte as its administrative centre. Ambitious plans to build a new international airport and seaport were announced in 2007. In 1999, the Sirte Declaration was signed in the city by the Organisation of African Unity in a conference that was hosted by Gaddafi. In 2007 he also hosted talks in Sirte to broker a peace agreement between the government of Sudan and warring factions in Darfur. In 2008, China Railway Construction Corporation won a $2.6 billion bid in Libya to build a west-to-east coastal railway 352 km (219 mi) from Khoms to Sirte and a south-to-west railway 800 km (500 mi) long for iron ore transport from the southern city Sabha to Misrata. On 5 March 2011, anti-Gaddafi forces said they were preparing to capture the city. However, on 6 March, the rebel advance was stopped during the Battle of Bin Jawad before reaching Sirte. Government forces launched a counter-offensive that recaptured Ra's Lanuf and continued to advance as far as the outskirts of the de facto rebel capital of Benghazi. Under United Nations Security Council Resolution 1973, several Western and Arab countries then intervened with air and missile strikes, which turned the tide again in favour of the rebels. On 28 March, Al Jazeera reported that Sirte had been claimed to be taken by rebel forces overnight with little resistance, but other news organisations later reported that rebels and Gaddafi forces were fighting on the road between Bin Jawad and Sirte. By 30 March, Gaddafi loyalists had forced the rebels out of Bin Jawad and Ra's Lanuf and once again removed the immediate threat of an attack on Sirte. In August, the city faced a more severe threat from the rebels as the loyalist position deteriorated rapidly, with rebels making gains on multiple fronts. As Tripoli came under attack, other rebel forces based in Benghazi broke the military stalemate in the eastern desert, taking Brega and Ra's Lanuf. At the same time, rebels in Misrata pushed eastward along the coast towards Sirte, which then faced a pincer movement from the rebels on two fronts. On 24 August, rebel units were reported as being 56 km (35 mi) from the city. On 27 August, Bin Jawad – about 150 km east – was once again recaptured by the rebels. It was also reported that the National Transitional Council were in negotiations with tribal figures from the city for it to surrender to rebel forces. In a radio address on 1 September 2011, Gaddafi declared Sirte the new capital of the Great Socialist People's Libyan Arab Jamahiriya, replacing the former capital Tripoli, which had been captured by rebels. Anti-Gaddafi forces surrounded the city during September 2011 and began a long, difficult battle there, hoping to bring the war to an end. On 20 October, after suffering massive casualties during a siege that lasted over a month, NTC fighters mounted a major offensive and took control of the last remaining district of Sirte, "Number Two", that was in the hands of regime loyalists. Muammar Gaddafi attempted to flee the city, but he was injured and captured by fighters. He was killed in custody less than an hour later. Sirte was left heavily damaged by a month of intense fighting, which was preceded by NATO airstrikes throughout the war, and was considered to have been subjected to the most damage of any Libyan city during the civil war. Many homes were ransacked and looted by fighters, angering residents including those loyal to Gaddafi and those sympathetic to the revolution. Many streets and buildings also experienced flooding as water mains were destroyed, though it was unclear by which side. Landmarks like the Ouagadougou Conference Center, which became an impromptu fortress for the city's defenders during the battle, were ruined by artillery fire and blasts. A number of Libyan residents and fighters described the city as unrecognisable after weeks of siege. In April 2012, almost six months after the civil war, more than 70 percent of the inhabitants had returned to Sirte. Rebuilding of the city started, although unexploded ordnance still posed a great risk to civilians. In February 2012, some local residents said they felt abandoned by the National Transitional Council (NTC), but the new government had promised to rebuild the city and Deputy Prime Minister Mustafa Abushagur insisted this would happen. Some local rebuilding was done in 2012 and 2013, but reconstruction of municipal services did not begin until a 9 million Libyan dinars reconstruction project started in 2014. During the widespread chaos and civil war that followed the revolution and led to the erosion of territorial control under the General National Congress (GNC) (which had succeeded the NTC) and the new GNC (NGNC), local loyalists to the Islamic State of Iraq and the Levant (ISIL), which had previously seized the port city of Derna, launched an attack in March 2015 to capture Sirte, which was then occupied by the Libya Shield Force, an NGNC-linked militia. Sirte fell to the ISIL loyalists in May 2015. Following the formation of a new Tripoli-based government, the Government of National Accord (GNA), an offensive backed by the United Nations was launched in May 2016 by GNA-aligned forces, known as the Bunyan Marsous, to recapture Sirte. After two months of advances, pro-government forces took control of ISIL's Sirte headquarters on 10 August 2016, although pockets of ISIL resistance continued to prolong fighting through the end of the year. Sirte was substantially under the control of the GNA by 6 December 2016. A contributing factor to the recapture of the city were the over 400 airstrikes organized by the United States Africa Command against ISIL positions during the months-long battle. Approximately 700 Libya pro-government fighters and 2,000 ISIL loyalists died in Sirte between May and November 2016. Mayoral elections are scheduled for 12 December 2016 with the previously (2015) municipal councilmen taking office again. ^ "World Gazetteer". Archived from the original on 16 December 2012. ^ "Sirte, Libya: Gadhafi's hometown seems largely destroyed". The News Tribune. Tacoma, Washington. 16 October 2011. Archived from the original on 24 December 2011. ^ P. G. W. Glare (1982). "Syrtis". Oxford Latin Dictionary. Oxford: The Clarendon Press. p. 1897. ISBN 0-19-864224-5. ^ "Struggle to salvage Darfur talks". BBC News. 29 October 2007. Retrieved 29 March 2011. ^ Tomasevic, Goran (5 March 2011). "In disorganized surge, Libya's rebels push west along shifting front line". Christian Science Monitor. Retrieved 6 March 2011. ^ "Libya: Rebels battle for road to Gaddafi hometown Sirte". BBC News. 28 March 2011. Retrieved 28 March 2011. ^ "Libya: Gaddafi's fighters force rebel retreat". BBC News. 30 March 2011. ^ Erdbrink, Thomas; Sly, Liz (2011-08-23). "Libyan rebels storm Gaddafi compound in Tripoli". The Washington Post. Retrieved 2011-08-23. ^ Stephen, Christopher (2011-08-24). "Libyan rebels advance on Gaddafi's home town". The Guardian. www.guardian.co.uk. Retrieved 2011-08-24. ^ "Libya rebels in "fierce" fight for Sabha--spokesman". Reuters. 2011-08-23. Retrieved 2011-08-24. ^ "From voice said to be Gadhafi, a defiant message to his foes". CNN. 1 September 2011. Retrieved 1 September 2011. ^ "Muammar Gaddafi killed as Sirte falls". Al Jazeera English. 20 October 2011. Retrieved 20 October 2011. ^ "Gaddafi's final stronghold falls: Libyan forces conquer Sirte". The Daily Telegraph. 20 October 2011. Retrieved 20 October 2011. ^ a b "Sirte and Misrata rebuild in wake of Libya conflict". France 24. 31 May 2013. Archived from the original on 31 May 2013. ^ "Sirte fighter indignant at level of city's destruction". The Daily Star. 20 October 2011. Retrieved 20 October 2011. ^ Peachey, Paul (14 October 2011). "Through hell and high water: final push in battle for Sirte". The Independent. Retrieved 20 October 2011. ^ "Gaddafi's dream in ruins". News24. 13 October 2011. Retrieved 20 October 2011. ^ Head, Jonathan (9 February 2012). "Should Libya rebuild Gaddafi hometown of Sirte?". BBC News. Retrieved 17 February 2012. ^ Adel, Jamal (5 June 2014). "Town of Sirte launches massive reconstruction project". Libya Herald. Archived from the original on 8 June 2014. (Subscription required (help)). ^ "Libia nel caos, l'Isis conquista Sirte "Minaccia a pochi km dall'Italia"". Corriere Della Sera (in Italian). 13 February 2015. Archived from the original on 13 February 2015. ^ a b c "After 4,000 dead and wounded Bunyan Marsous finally beats IS in Sirte". Libya Herald. 5 December 2016. Archived from the original on 8 December 2016. ^ "Libyan forces recapture ISIL headquarters in Sirte". Al Jazeera. 11 August 2016. Archived from the original on 11 August 2016. ^ a b Mannocchi, Francesca (6 December 2016). "Libya's Sirte in rubble after ISIL battle". Al Jezeera. Archived from the original on 7 December 2016. ^ Jawad, Rana; et al. (6 December 2016). "Libya conflict: IS 'ejected' from stronghold of Sirte". BBC News. Archived from the original on 7 December 2016. ^ Joscelyn, Thomas (7 December 2016). "Pentagon: Islamic State has lost its safe haven in Sirte, Libya". FDD's Long War Journal (Foundation for Defense of Democracies). Archived from the original on 9 December 2016. ^ "Casualties continue to rise in battle for Sirte". Libya Heraald. 16 November 2016. Archived from the original on 30 November 2016. ^ Mzioudet, Houda; Fornaji, Hadi (6 December 2016). "Mayoral election set for Sirte and municipal elections for central Zawia and Bani Walid". Libya Herald. Archived from the original on 8 December 2016. Wikimedia Commons has media related to Sirte. Wikivoyage has a travel guide for Sirte.